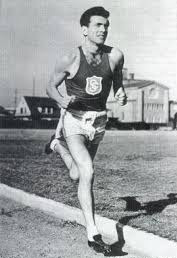 Lou Zamperini was a high school star distance runner in Southern California in the 1930s, and competed in the 1936 Olympics shortly after graduating from high school. He was a solid distance runner, winning a state high school championship and attending Southern Cal on a track scholarship, but his life after athletics is far more interesting. Zamperini enlisted in the United States Army Air Corps in 1941, and was deployed to Hawaii as a bombardier. On 27 May 1943, his aircraft went down due to mechanical problems. Only Zamperini and the pilot, Russ Philips, survived. At home, all crew members were presumed dead, and Zamperini’s obituary appeared in US newspapers. However, Zamperini and his two crewmen managed to get out of the wreck of their B-24 and climbed into lifeboats. After 47 days, eating sharks and albatrosses, they were rescued by a Japanese fisherman near the Marshall Islands. By that time, one of them had died. They were arrested when brought to shore, and were moved from island to island, eventually landing in a prisoner-of-war camp in Japan in September 1943. For two years, Zamperini barely survived the reign of terror of Matsuhiro “The Bird” Watanabe, one of the most notorious Japanese guards during World War II. When released in 1945, he met a New York Times reporter. Telling him his name, the reporter failed to believe Zamperini, as he had read about his death. Zamperini managed to convince him with a university card, one of the few possessions he had after two years of imprisonment. The remarkable story made headlines at home, where he received a hero’s welcome. After the war, Zamperini began a new career as a Christian motivational speaker. One of his favorite themes is “forgiveness”, and he has spoken several times in Japan to former war criminals, several of whom had tortured him as a prisoner-of-war. Zamperini was given the honour of carrying the Olympic Flame three times: in 1984, 1996 and 1998. At the latter occasion, the Nagano Winter Olympics, he returned to Japan for the first time since 1945. Briefly before the Olympics, it was discovered that Watanabe was still alive as well, but a meeting with him was blocked by the Watanabe family. Zamperini wrote (with David Rensin) a book about his life and experiences, entitled Devil at My Heels. In 2010, well-known author Laura Hillebrand wrote his biography, Unbroken, in far more detail. A movie based on the Hillebrand book is in the works, being directed by Angelina Jolie. Personal Bests: 880y – 1:53.2 (1938); 1500 – 3:52.6 (1939); Mile – 4:08.3 (1938); 2 miles – 9:12.8 (1939); 5000 – 14:46.8 (1936). There is a discrepancy in the story about Louis Zamperini. You wrote: Only Zamperini and the pilot, Russ Philips, survived. \this is not correct. There were three survivors! The tail gunner Mac also survived; but died later during their ordeal in the boat. I love both books and read them with much interest.